Upgrade your Amano MJR time clock to ring perfectly synchronized bells for start of day, break, lunches, lunch end warning, lunch end, break #2, and end of day. Save $$ on lost labor. 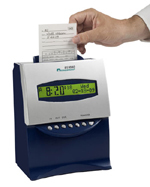 100 employee self totaling time card clock machine with two loud bells. One year guarantee, lifetime technical support. Self Totaling Work Shift Timer with 102dB horns. You know what this can do for your business, and how much work it eliminates for the payroll person. PIX200 fully upgraded with signal kit, external power supply, 1 loud 6" bell.